I’m a big fan of wrapping things in bacon. I am not sure when this dish was made, but I had been meaning to make a post about it. Most of the meat that I purchase are grass fed or pasture raised. The less chemicals I can consume the better. Bacon is always going to be uncured because I would also like to cut back on sugar. Oh and my bacon will ALWAYS be 100% pork. I am SO not a fan of turkey bacon. It tastes weird, if you flip the package and read the ingredient list in the back it’s full of stuff I can’t pronounce, and IT’S NOT REAL BACON! Why deny yourself the deliciousness of REAL bacon and eat that fakey stuff? I’ve gotten into a few discussions with friends who argue that I eat too much bacon and that my cholesterol is going to go through the roof and I’m going to get fat. Listen here party people… Since I’ve changed my lifestyle to Paleo, I’ve started weight training, and I’ve gotten back on marathon training I have never felt better or stronger. I have challenged people to stick on this lifestyle change with me for a week and NO ONE has been able to do so. Then again, that person is going to have to WANT to change. That person is going to have to make the decision to change their life. I want to help them. I want to motivate and support them without no hesitation. They just have to make that choice. I can’t do it for them. Again, I am more than willing to help. Just ask. 1. Fire up the grill!! 3. Wrap the bacon and try to wrap it so that the ends meet on the same side. See picture below. 4. By now, the grill is ready (propane will be medium to medium high heat, and Charcoal… well, when it’s not a fiery inferno) place the steak seam side down. 5. Cook until the bacon is crispy. About 3-5 minutes on each side. Take off heat and let rest for 5-10 minutes. 6. 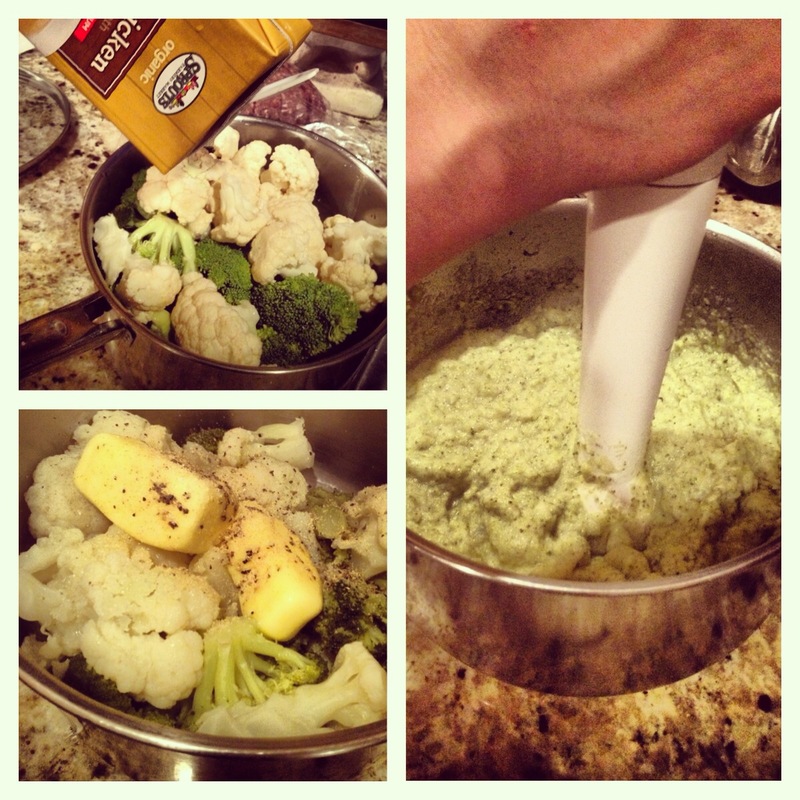 Cut up, serve with a side of your favorite veggie and ENJOY! You can also cook this on the stove top. I would prefer that you didn’t use a pan with teflon as eventually the teflon will burn off and the chemical fumes will get into your food. Sometimes they will even start to flake off and that too will get in your food. When it starts to flake like that GET RID OF IT!! Your food will taste significantly better if you change your flaky teflon pan to a nice stainless steel one. Oh yeah, pan on medium high heat and no need for oil. The bacon will start to cook, the fat will melt out, and that is your oil. POW! Again, cook for 3-5 minutes on each side or until the bacon is brown and crispy, and let meat rest for 5-10 minutes before cutting and serving. ENJOY! I am a big fan of making food that takes care of itself. 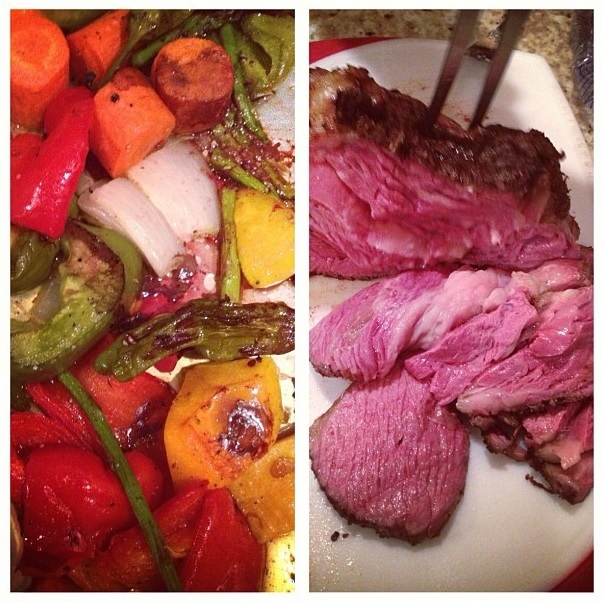 Roasts and Crock Pots are the best! You season the food, you set the temperature, you set the timer (which is usually a couple of hours) and you walk away. There’s no watching the food to make sure it’s not burning. There’s no stirring, no tossing, no nada. Just set it and forget it! 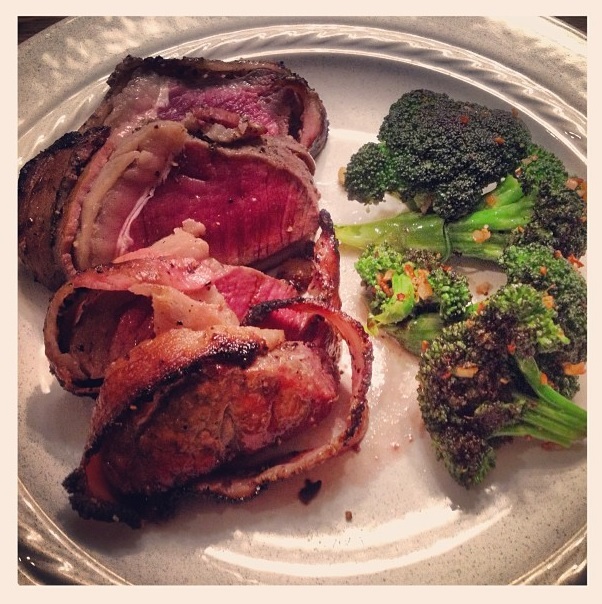 A couple of months ago, PaleoJoe and I had stopped at Lunardi’s and picked up a grass-fed beef roast. We were planning on going to the gym, but wanted to get our food situation handled before heading over. 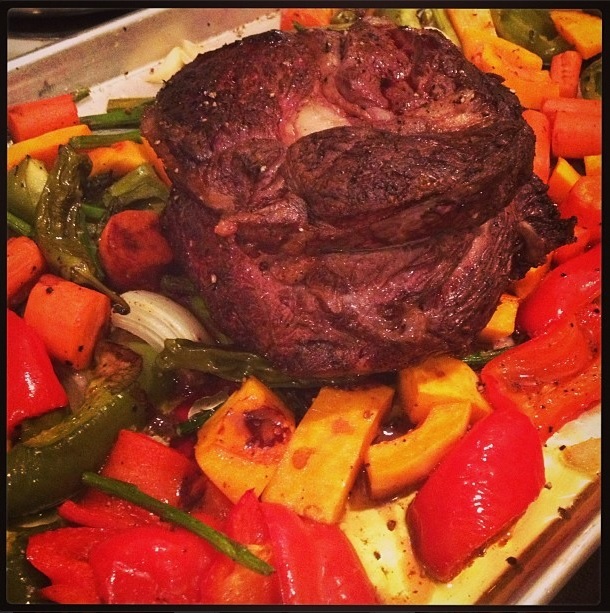 When we got to his place, we preheated the oven, seasoned the meat, and prepped the veggies. Then just… say it with me now!! set it and forget it! 😛 I think I had gotten that line from some infomercial. I can’t remember which one, but it stuck. Very catchy. 2. Now this part is optional, you don’t have to do it if you want. I personally like to sear my meat because I like the crunch of the crust on the outside and then the tasty soft and moist innards. Kind of like bread. On high heat, put a cast iron grill or a stainless steel pan. (DO NOT use a pan with teflon on it, or any other non-stick pan that can not withstand high heat! There are chemicals in teflon or in that non-stick pan you have, and that burns and gets into your food. If you can, get rid of it and replace it!) 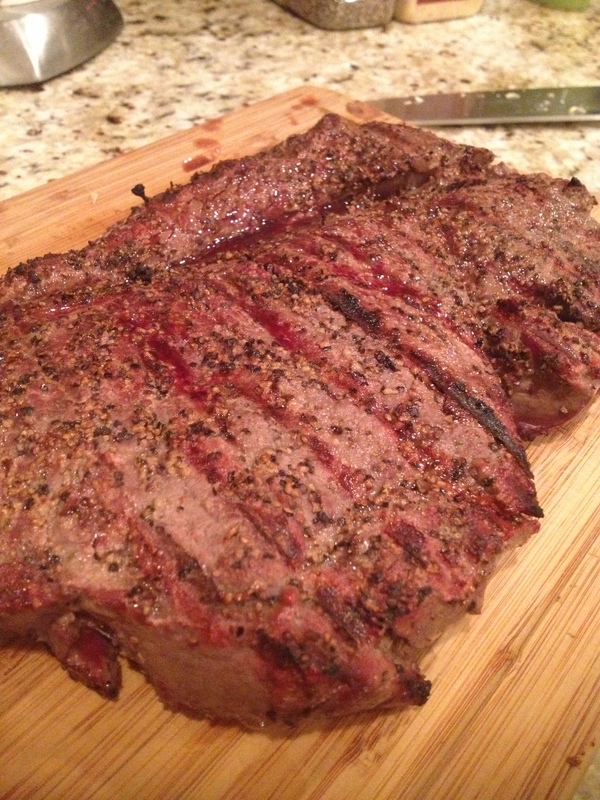 Put in 1-2 tablepoons of coconut oil and sear your meat on all sides. Maybe 1 minute on each side or until you get nice browning. More on this at the bottom of the post. 3. In a baking sheet, put 1-2 tablespoons of coconut oil so that your veggies do not stick. 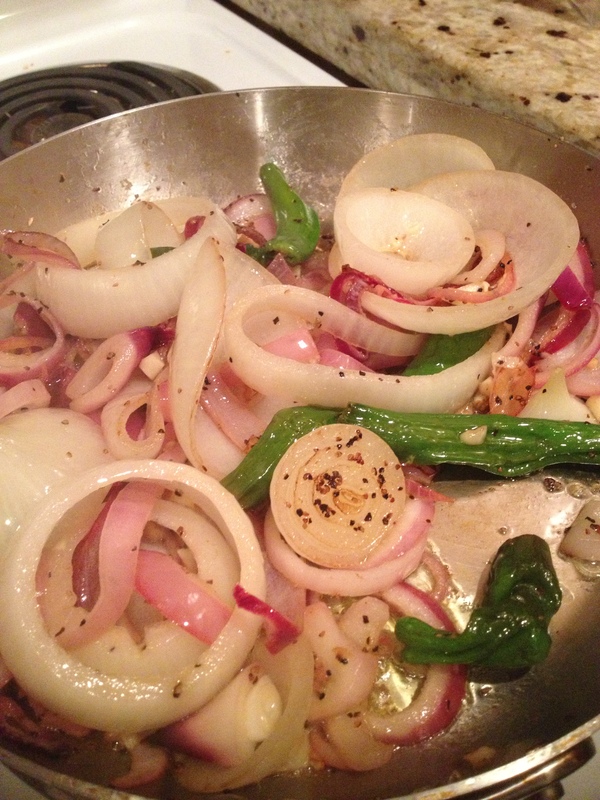 Add veggies in one layer on pan and season to your heart’s content. 4. Put pan in bottom level of oven and the roast goes in the middle right above that pan. 5. 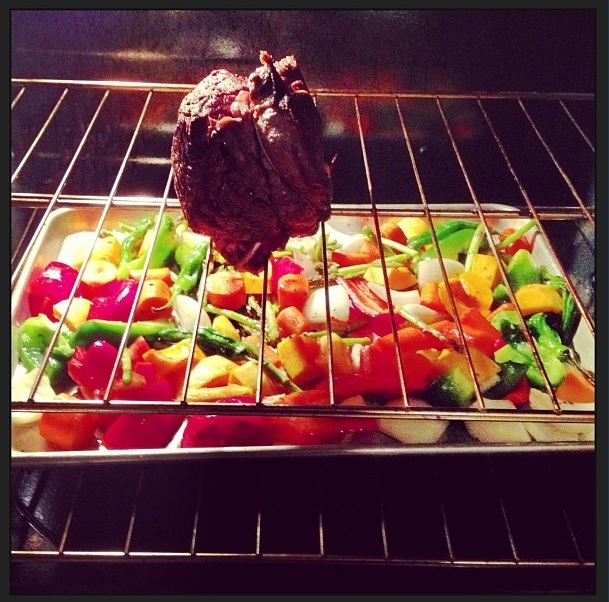 Oh yeah… those meat drippings are going to fall onto that bottom pan and add some more flavor to your veggies. Now set the timer for 1-1/2 to 2 hours (depending on size of meat and how cooked you want it to be. 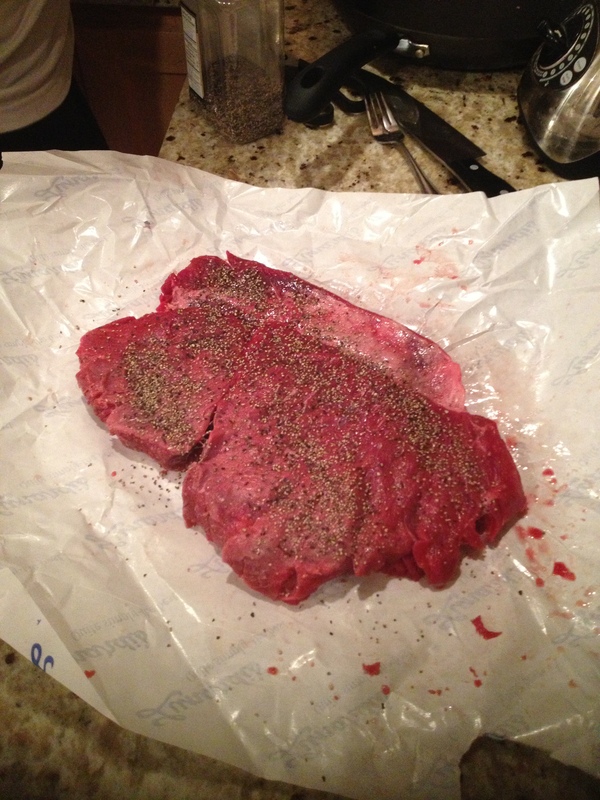 PaleoJoe and I like our meat rare) and walk away. 6. When the timer goes off, take meat out and put it on the veggie tray. Let sit for 15 minutes. In regards to the optional searing of the meat. I do it, because I think it makes the meat look pretty when all is said and done. 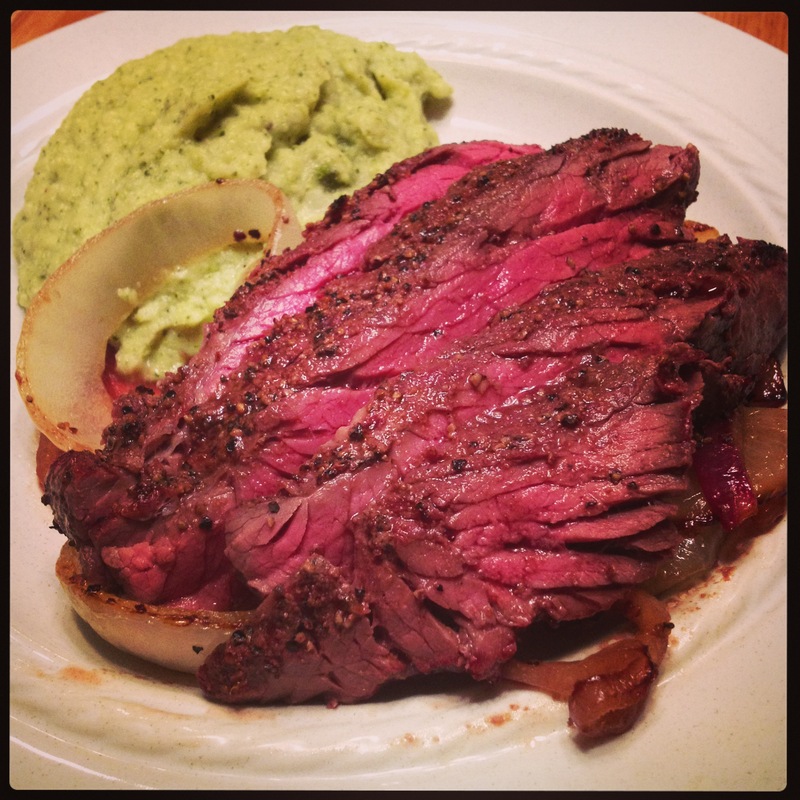 I’ve read articles that say searing the meat prior to roasting will keep the moisture in. I’ve read articles that say it doesn’t do squat, or there is very little difference in moisture levels. 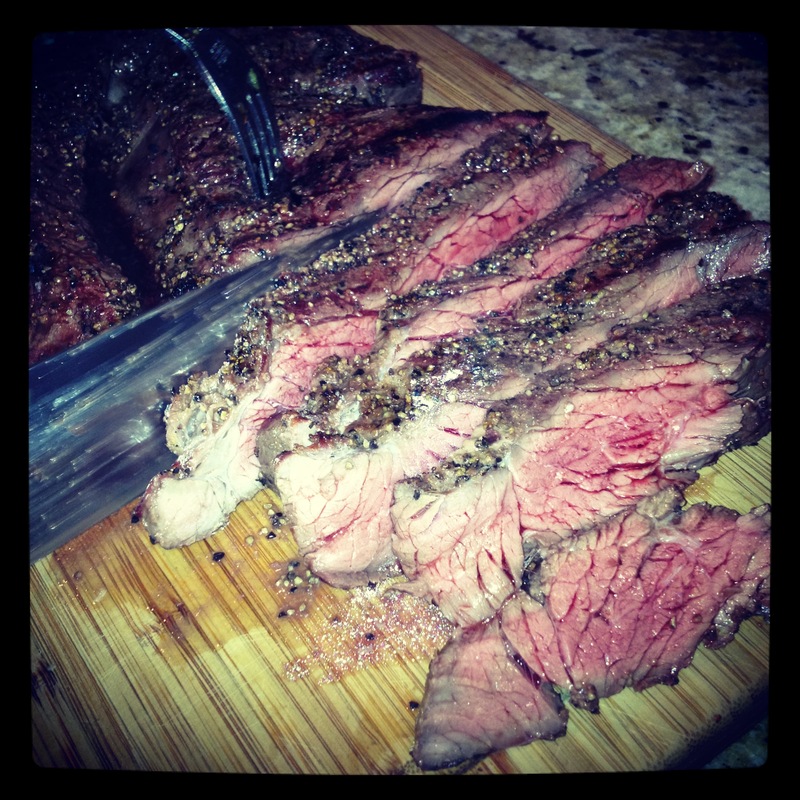 If you want your meat to stay moist let it rest for at least 15 minutes. While it’s resting the meat is going to continue cooking, and the moisture is going to redistribute and come to a rest in the meat. You ever notice how you cut into meat right after it comes out of the heat and it’s all juicy and moist, but then once it’s all carved and you come to eat it, it’s dry? All the juices have poured out and have been sucked into the cutting board right? Put some olive oil or coconut oil on the cutting board. That should help keep the juices from being sucked in the board. Most importantly… leave your meat alone! Let it rest! It just did its thing in the oven and now it’s tired. Let it rest so that you can enjoy a juicy meaty bite. Try it and let me know how it goes.